Sometimes, it can seem like people from history are from another planet. Their clothes, language, and culture can make them seem completely alien to us. 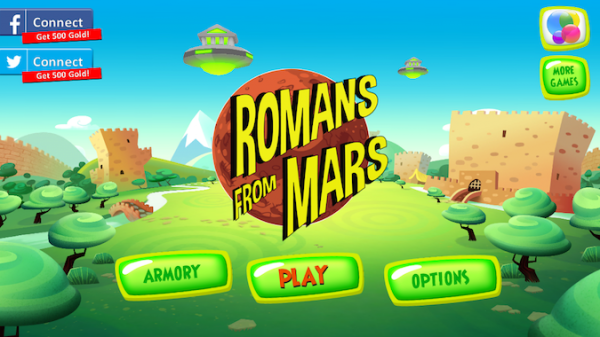 Romans From Mars takes that idea one step further. These fighters really are from another planet, and they are invading Earth. 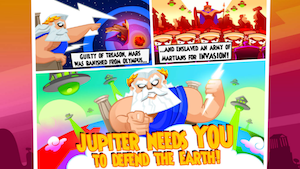 Jupiter has banished Mars to, well, Mars as punishment for his treachery. While he was there, he decided to raise an army so that he can exact his revenge against Jupiter. Now, you are all that stands between civilization and a Martian invasion. No pressure. You control a ballista. 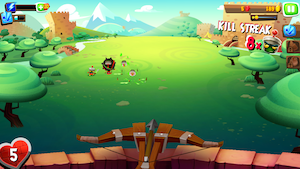 To fire it, just tap on the screen where you would like your arrow to hit. 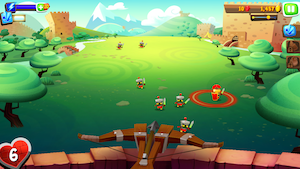 The challenge in this game is that the bad guys keep moving towards you. You have to take that into account when you aim your ballista. They also move faster as you go through the levels. 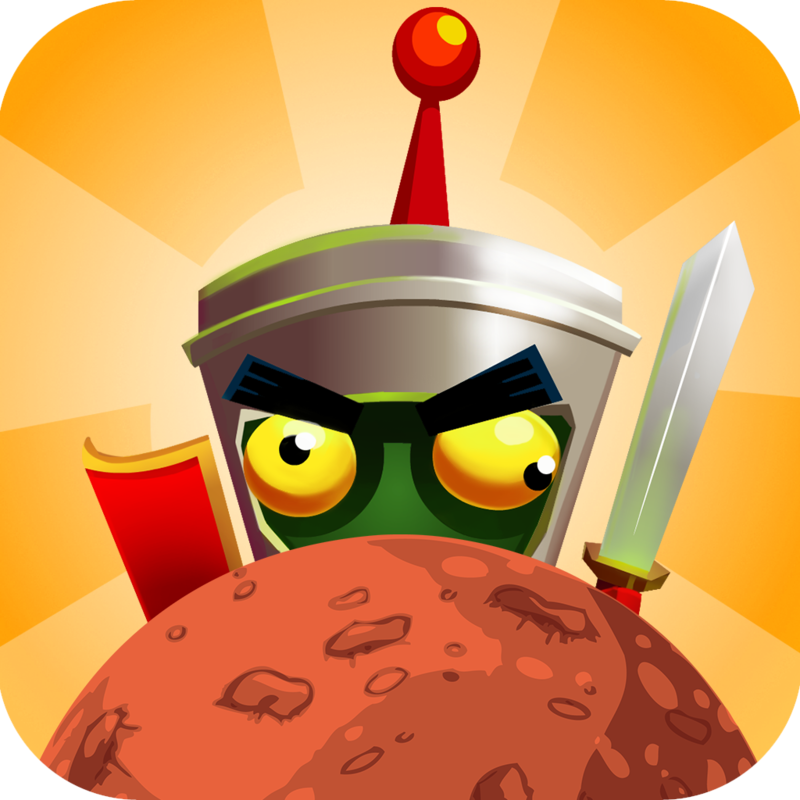 Your goal is to keep the advancing Martians from hitting your wall. You begin with a wall health of five. You can upgrade your wall to be able to withstand more hits. Every time a Martian reaches your wall, it subtracts a point. You get a game over when you run out of health. You can make other upgrades as well. You can increase the reload rate or the flight speed of your arrows. You can also expand your blast range. 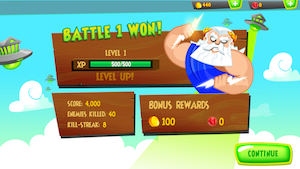 There are more upgrades for your special abilities as well. You can increase the amount of gold you earn per level, wall repairs, and shield duration. You buy these upgrades using two different currencies. There’s gold and gems. You earn both by playing the game. However, gold is by far the most prevalent currency. The upgrades that involve your ballista and wall health are paid for with gold. The special abilities and extras like the increased shield duration use gems. If you would like to buy some extra gold or gems, there are several in-app purchases available. Gem packages range from 50 for $1.99 to 3,000 for $49.99. The gold packages range from 20,000 for $0.99 to 1.5 million for $29.99. There’s also a gold doubler option for $4.99 that gives you twice as much gold per level. This is a hilarious take on history. I loved how it incorporated Roman mythology. It has a creative premise, and I enjoyed the graphics. This is an awesome game to try out. Romans From Mars is a universal app, and it’s available in the App Store for FREE!